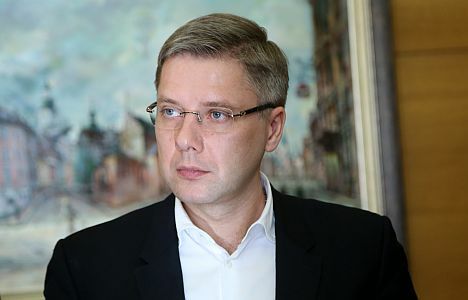 On Friday, 5 April, Latvia’s Environment Protection and Regional Development Minister Juris Pūce may announce the dismissal of Riga’s Mayor Nils Ušakovs, according to unofficial information from LETA. The Law on Local Governments makes it clear – if the head of a city council fails to perform duties in accordance with the law, the environment protection and regional development minister may decide to dismiss the mayor from their post after receiving explanations. The chairman of the city council has 30 days after a decision for their dismissal has been made to turn to court to appeal it. If the court decides to overturn the minister’s decision, the chairman of the city council becomes eligible to receive the wage for the period of time when they were suspended. Pūce has yet to announce his decision. However, LETA agency’s information suggests the order for Nils Ušakovs’ dismissal is ready. As it is known, Environment Protection and Regional Development Ministry has noticed a number of possible violations in relation to supervision over public transport company SIA Rīgas satiksme and the work performed by Riga City Council. Ušakovs was asked to provide explanations on this. He was given one week’s time to provide explanations. 28 March was the deadline. Ušakovs sent a letter with explanations at the end of March. He believes he has parried all criticisms Pūce voiced about his work. Ušakovs told journalists that Pūce’s request for explanations was legally weak and heavily politicized. Pūce, on the other hand, said Ušakovs published statements did not surprise him.